I always wanted bigger triceps. To me, big triceps really makes the arm look impressive. I was able to build up my biceps reasonably well at an early age but nice triceps eluded me. Recently I have stumbled upon a routine that has added some nice size to my triceps, which after training for 20 years is something to be excited about. First, a bit of anatomy. Your triceps has 3 heads – the Long Head, Lateral Head, and Medial Head (feel free to stop listening to someone the instant they start talking about the non-existent ‘short’ head of the triceps). The Long Head is unique in that it is a two joint muscle – it crosses both the shoulder and the elbow. The Lateral Head is on the outside of the arm and in my opinion it is the easiest to develop with training (basic pushdowns will do the job). Unfortunately it is also the least important when it comes to bench pressing. The Medial Head is the smallest head, it is on the inside of the arm above the elbow. You would generally only see this when you bring your arm up and flex your bicep. See the pics below for more info. All of the tricep heads produce elbow extension, which is just straightening out your elbow as in a pushdown or a bench press. Only the long head also produces shoulder extension which is when you bring your arm down in front of you (think of a Karate chop). The elbow needs to be relatively straight for the triceps contribution to be significant to this motion. The long head is important in maximal strength because it crosses the shoulder joint and adds significantly to joint stability – a bigger long head means more tissue to compact the joint which means more force can cross the joint (see the book All About Powerlifting for more detail about the importance of joint stability and how that relates to strength). It is extremely rare to see a really good bench presser without a very well developed long head. The medial head helps perform the lockout portion of elbow extension, it contributes to those final inches of a press. It is also pretty important in bench pressing. 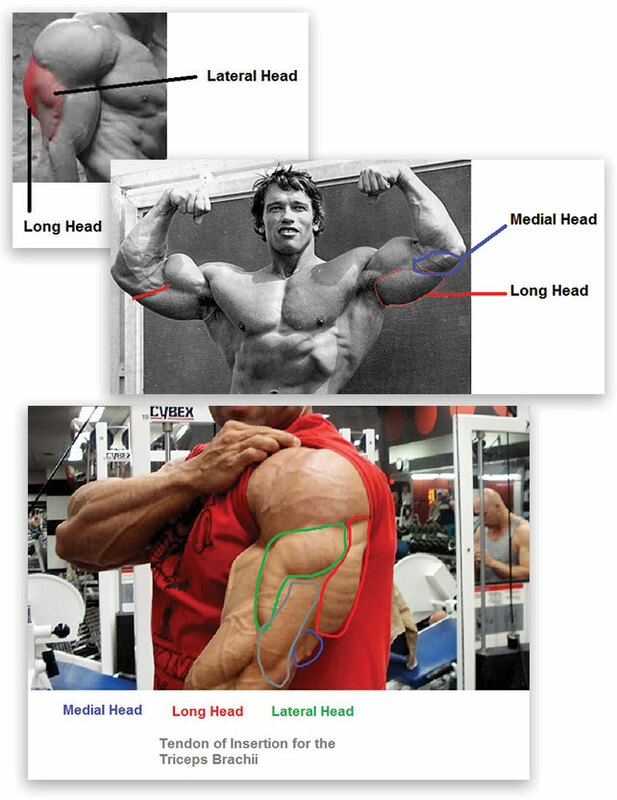 The lateral head also helps out but in my opinion, because of its angle of pull, it is the least significant contributor of the 3 heads in the bench press. This plan is going to involve compound sets (back to back sets of 2 exercises for the same muscle group, some people call that supersets). It is pretty simple and it should only take 20-30 minutes to complete. See the linked vids for a brief visualize demonstration of how to perform the exercises. Progression is key in all strength training. Here is the progression I like to use for this set up. Start with the minimum number of reps suggested, so on the pullovers use 8 reps. Each week add reps, don’t change the weight. My progression goes like this: 8, 10, 12, 15, 20 reps. Once you get to 20 reps (on week 5), then go up 10 lbs and start over again (back to 8 reps). On week 1 start with a short rest period (1 minute). Then add 30 seconds to the rest each week, this way as the sets get tougher you get more rest. On week 5 you get 3 minutes rest (you’ll need it with sets of 20). When you go back to the 8 reps on week 6 go back to a 1 minute rest period. Feel free to start pretty light, this is reasonable volume and the tendon of the tricep can be sensitive to overtraining. The good news is I have found these particular exercises to be rather elbow friendly. For example I just used 60 lbs on my DB Tricep Pullover and 40 lbs on the overhead rope and I got a serious pump doing this and continue to do so even 10 weeks into the plan. If you are not happy with the bulk of your triceps, give this routine a go and see how it works for you. By spring those sleeves will be tight and that bench press should be up. Thanks for writing this Tim! I have always had the same problem. My biceps grow pretty fast when I focus on them but never could build up my triceps. I even got my close grip bench up to 85-90% of my best bench 1RM and still didn’t notice any growth. I’m going to give your program a try starting next week!